It’s six o’clock on Saturday night and almost 200 people are gathered outside Fairfield train station. Ordinarily such a gathering might attract the attention of law enforcement but we are a mild mannered lot, standing patiently, consulting our foldout maps and expertly corralled by people in fluorescent orange caps that have the word “women” printed in black across the crown. Daylight saving started last week, so it is twilight: the birds are loud, the trains are soft and the cars roll slowly by. We stand opposite two butcher shops, a grocery and a tobacco store. The performance begins with a Welcome to Country from Aunty Wendy, reminding us that the suburb of Fairfield stands on the land of the Cabrogal people of the Darug nation. From here, the performance follows Powerhouse Youth Theatre Artistic Director Karen Therese’s now trademark structure, which combines the processional and the installational as we wind our way through the neighbourhood, occasionally pausing for a performance or artwork and then carrying on. We are invited to cross the road and follow an Assyrian wedding procession led by a band of men in navy pants and tan vests. They also sport black caps with red, white and blue feathers and one is wielding a silver sword. The women are in deep purple and black velvet dresses, with beautiful silver belts and headpieces. Three streets have been blocked off for the occasion, which is lucky because we are walking on the road headed for a roundabout. We turn left and head down Harris Street, past cafes and hairdressers on the right and Powerhouse Youth Theatre on the left. We turn right into a narrow passageway that opens out onto a concrete courtyard wedged between a set of flats and a car park. From the flats, an intrigued father brings his baby down for a look while from the second floor of the car park a man in a fluorescent vest films with his phone. Indeed, phones are absolutely everywhere: even participants often film and photograph as they perform. The dancing continues and the procession becomes a circle, incorporating several audience members, who are held by the hand and encouraged to join in the gentle bounce. When the dancing comes to an end, most audience members head into an adjacent garage. Inside, Kate Blackmore’s two-screen video work, All Wedding Wishes, illuminates the dark space. Also focusing on an Assyrian wedding, it has three strands: interviews with the bride and her parents; footage of the wedding preparations; and then scenes of the wedding itself. It’s a highly performative affair, with the bride and groom posing patiently for the photographers. Later, at the Grand Paradiso Reception Centre, footage seemingly from earlier in the day—of the bride getting ready for instance—is projected onto the wall. Finally, a smoke machine bursts into action as the couple take to the floor for their first dance. It’s so colourful and theatrical that Blackmore needs hardly add anything, but it’s clear from the interviews that she’s not just another wedding photographer and that bride Nahren Georges and her family place great trust in her. They speak with a mixture of pride, joy, relief and sorrow about the wedding and explain in detail how it functions as both a welcome distraction (from worrying about family far away) and an important affirmation (signifying personal and cultural survival against the odds). These gentle interviews bring an emotional weight to a work that might otherwise have become a meta-document of an already highly documented event. On the night that I attend, I happen to stand near one of the participants, who explains to the women next to him that his house is in the video. “And now I’m here!” he exclaims. Once I’ve seen most of the video, I head back out onto Harris Street to Powerhouse Youth Theatre to see a series of zines, animations and self-portraits as superheroes created by the students of Fairfield High School in collaboration with MCA art educators. I’m admiring the superheroes when a group of women come out of a rehearsal room and head outside. They’re costumed so I follow them back to the roundabout for Zoe Scoglio’s In the Round. Three cars arrive, one from each direction, announcing their arrival with honking. 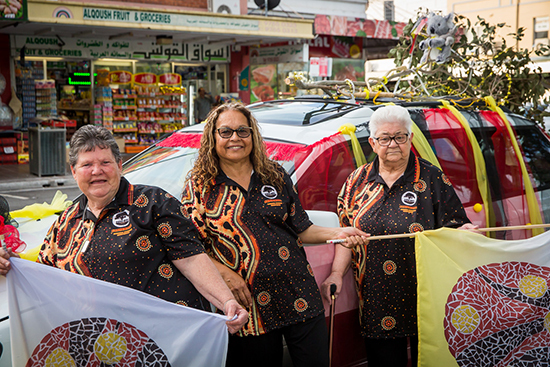 The first belongs to a group of Aboriginal women, who have adorned their white car with red, yellow and black tulle, green leaves and a grey toy koala riding on the rooftop like a tiny Pope. The second belongs to Khmer women, whose red hatchback is festooned with flowers and blue and white gingham bows. The last car belongs to Iraqi women and it too has ribbons and tulle, though in green. The women exit their cars, circle the roundabout and invite the audience to join them. I do a few laps with a friend before we peel off to talk. We watch as another friend takes a picture for one of the participants. He insists on reciprocating by taking a picture of her, but not with her camera, with his—a record of the visitors who came to town one night in October. It’s a neat inversion of the typically masculine ritual of hooning around the block in your car; instead we are promenading around the roundabout, admiring the newly feminised cars and taking selfies. I’ve always read these young men as claiming sonic space in a society that grants them little cultural or political space, but this is an important reminder that women might not be permitted—or do not permit themselves—to do the same. Next, we head up Ware Street to Fairfield Chase. The shops are closed and the fruit is covered but the fluorescent lights are on and the food court makes for a surprisingly good theatre in the round. In the middle of the space is what I can only describe as a sawdust mandala, but, rather than tracing sacred patterns, it depicts flowers, brand logos and the words “Pero no cambia mi amor” (Google translate helps me to decipher it as “But it does not change my love”). 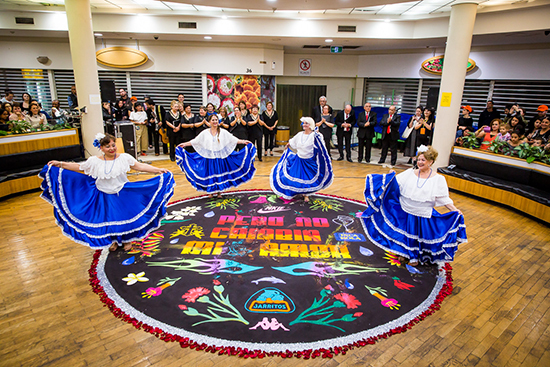 The work is a modern version of the traditional alfromba de asserin from Central and South America, created by Claudia Nicholson and the local South American community. The Spanish Speaking Community Choir sings two songs with flute and guitar accompaniment. Then there is dancing with four older women in blue and white ruffles, their feet messing the mandala. Behind me, two young women are itching to join in and are delighted when an inviting wave finally comes. Once the mandala has been destroyed, we head to the car park for the final performance of the night, Hissy Fit and Maria Tran’s Supreme Ultimate. On the top storey is a platform stage and three large screens on which three women, one on each, perform martial arts drills. On the left, a woman beats a punching bag; in the middle, another does a high kick, resets, rotates and then eventually does a flip. On the right is Maria Tran, martial arts movie actor and artist from Fairfield. She is an elegant mover; even moreso in slow motion, all three screens eventually focusing solely on her, showing footage of her striding through the car park preparing for a fight. After this surprisingly long introductory screening, the live bodies finally arrive. 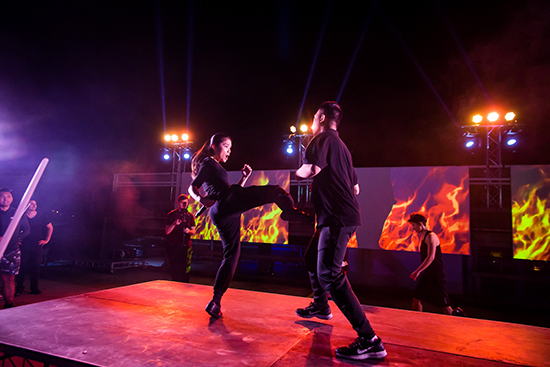 There is the beginning of a dragon dance, but a fight breaks out between the two operators. One woman sends the man packing. Two others strike poses and execute kicks and punches. Tran joins them and they perform another brief series of moves. The movement is fluid but the dramaturgy is awkward. There are some bows and thank-yous, including to the audience for attending, and with that the evening is over, unless of course you’re headed to the Green Peppercorn for the after party. I find it increasingly difficult to review this genre of performance, as my experience as an audience member seems less important than that of the local participants. It is clear from their enthusiastic documentation of the event as well as their conversations with the audience that they are enjoying themselves. Taken together, the evening’s many parts become a performance of identity, community and hospitality. As an outsider, I feel slightly ambivalent about the encounter and its ethnographic structure. I’m thinking of Barbara Kirshenblatt-Gimblett’s famous 1991 essay “Objects of Ethnography,” collected in her book Destination Culture: Tourism, Museums and Heritage (1998). 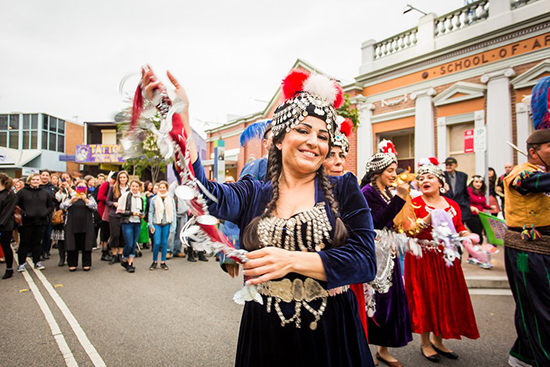 She writes about various genres of ethnographic performance, including museum exhibitions, neighbourhood excursions (often advertised as “discover the food of …”) and multicultural festivals. The overall effect of such performances, she argues, is to cast recently arrived migrants as the ethnographic other. This serves to create a social distance to counter the experience of physical proximity when we pass each other on the street. While Kirshenblatt-Gimblett was writing about London and New York of the 19th and 20th centuries, the situation in contemporary Sydney is slightly different. With its walking, dancing, drawings—and yes, eating—Women of Fairfield combines these genres into a single evening, but its overall effect is almost the reverse of what Kirschenblatt-Gimblett describes. For this performance seeks to counter Sydney’s social distance by creating physical proximity, if only briefly, by inviting audiences to spend time in a suburb they might otherwise not visit. Of course, the distancing effect of ethnography works for the participants too, who now return to their daily lives and locales with memories of the time they sang in the food court, danced on the roundabout and met strangers at the station. Ethnographic performance is not a problem per se, but it can involve problematic power relations. Occasionally projects like Women of Fairfield seem haunted by what Joseph Pugliese has called, in a different context, “infrastructural whiteness”—staging projects that are performed by migrant communities but are conceived, developed and credited to organisations and artists that are predominantly white. It seems to me that while these projects often invite inner-city audiences west, the invitation isn’t always returned. 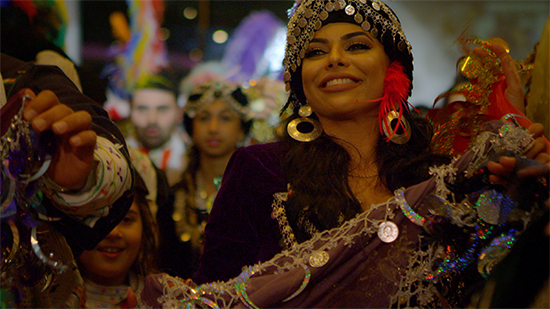 Perhaps the next step for C3 West and its collaborators is to contemplate how to reverse the ethnographic gaze: commissioning an Assyrian-Australian video artist to document an Anglican wedding; and encouraging the good people of Potts Point to close their streets for an evening and perform their identity, hospitality and gratitude. And RealTime will send a non-Caucasian reviewer. In Conversation: Women of Fairfield will be held at the MCA, 1-4pm, 3 December “to reflect on the successes and complexities” of Women of Fairfield.